It's the end of the summer, which means we are sadly bidding farewell to our fabulous summer interns, getting lonely and scared about how we will possibly do amazing work in the coming months without their brilliance, ingenuity, and creativity. And then comes the part where we recruit new interns, get blown away by their abilities... and the cycle continues. 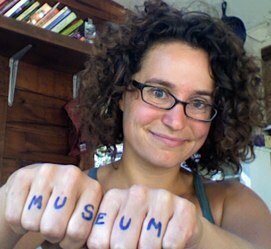 At the Santa Cruz Museum of Art & History, we take our interns seriously, give them real responsibility, creative challenges, and meaningful work opportunities. We ask a lot and we give a lot and at the end of the day we sometimes throw parachute men off the roof. I'm particularly excited about two internships that relate to participatory exhibition design. We also have fabulous opportunities in Community Programs, Education, and Development - please check the website for all the options and information on how to apply. You don't have to be a student to be eligible. Our interns include undergraduates, graduate students, and people of all ages looking to jumpstart creative careers in community engagement. First, there is the Participatory Exhibit Design Internship. These interns work with our curatorial team to develop interactive and participatory components for upcoming exhibitions. Current and former interns have developed everything from games to personality tests to a whole-gallery installation of memory jars. We typically have two to three interns in this role, working 15 to 24 hours per week. Interns this year will be focusing on our winter Work in Progress show (Thomas Campbell, Ze Frank, Timber Framing) and spring Photography and Identity show. We are always looking for interns with strong graphic/3D design skills; the best interns can help us plan exhibits, design labels, AND learn to develop terrific participatory experiences for visitors. Fine print: all internships at the MAH are unpaid. We are happy to help you get school credit for your work here, and we love writing glowing recommendations for your future careers. Our interns tend to be highly self-motivated people who have always dreamed of having the latitude to make their dreams real. People who struggle tend to need more structure and direction than our institutional culture affords. Please feel free to comment or email with any questions. What's the String that Ties One Experience at Your Institution with the Next? In many ways, the ability to successfully set a powerful and useful expectation for museum experiences is MORE valuable than the ability to extend said experience. When you set an expectation, you frame an experience. Once visitors have already banged on the exhibits and watched the giant nostril show, the experience belongs totally to them. The chances of reaching and holding onto them back at home are small. They’ve formed their impressions of the on-site experience, and their chance of returning, becoming members, etc. is heavily based on those impressions. You can send them all the pleasant follow-up emails you like, but such notes are unlikely to be the motivating factor that brings them back through your doors. While I still believe that framing the experience with marketing and at the beginning of a visit is important, a workshop last week taught me that the end of the visit is potentially very, very important when it comes to encouraging deeper involvement with the museum. I now realize that people can have a great experience and have NO CLUE what other opportunities (return visit, membership, in-depth programs) are available to them. I don't care how many platforms you're active in--if they are not connected to each other, people will not aggregate the experiences. What's missing for these visitors who attend, enjoy, and don't (or sporadically) return? They are missing a string. Let me explain. For a long time, I've thought of museum visits or cultural encounters as pearls on a string. Each experience is a pearl. They are not necessarily linear or identical to each other. But if you want to deepen the commitment between visitor and institution over time, you need a string that visitors can hang their pearls on, a thread that holds the growing relationship together. No string, and you've just got a bunch of visits rolling under the furniture. Yes, pre-visit marketing, announcements, and welcomes are essential to get that first pearl in a visitor's hand. But we all know that it's easier to keep a current user/visitor/patron than to acquire a new one. How do you build your relationship with that person who has gotten their first pearl? How do you give them the string? Last week, as the kickoff for the Loyalty Lab project, the experience design firm Adaptive Path facilitated a workshop at my museum for staff and visitors in which we created a "map" of the visitor experience at a museum event. Our goal was to wholly understand how visitors experience our events before, during, and after the visit. One of the surprises was a series of observations from casual visitors--people who attend an event or two per year, who are not members, and who tend to come because of word of mouth or an invitation from a friend. They all reported having a great time at the museum... and immediately letting go of it afterwards. There was no followup. They had not been asked to join an email list or take a newsletter or join the museum. They had not taken photos in our photo booth and gotten an email about them later. They were not part of our Facebook community sharing photos and stories from the event. They came, they made a pearl, and then they dropped in their pocket with the rest of their day. We realized from this discussion that we have a huge missed opportunity when people are leaving the museum. On their way in, they are excited, curious, ready to engage. They are not ready to hear about membership or take a newsletter about what's coming up next time. They bolt right past those tables to the "good stuff." But at the end, they've had a great time, and they want a takeaway from the experience. They WANT to join the email list. If we're smart, we should be developing a takeaway that both memorializes the visit and leads them to another. In other words, we should be giving them a string for their new pearl. As a concrete example, consider the library. The pearls are the books you read. But the string is the library card. I've always thought of the library card as the first thing you get at the library, but it actually comes at the end of the first visit, when you have loaded up with books and you want to take them home. The card is a passport to continue your experience with the books and with the library. You want the card because it's your ticket to proceed. But it also becomes the connector that ties one experience to the next. At our institution, we have several string candidates. Visitors make a lot of stuff here, and we're talking about ways they might be able to exhibit or share it with others in a way that encourages their return to see how their stuff has evolved. We're considering expanding our photo booth survey machine. We're talking about punch cards that serve as cultural passports with a range of museum-related missions or lead you to "earn" a membership. Or, there's just the simple starting point--a newsletter, a membership brochure, a friendly volunteer inviting you back. We're talking about shifting from having "greeters" to having "goodbyers" who thank you for coming and invite you to a next specific event. What's the string in your organization? How do you invite people back, and how do you help them collect and aggregate their experiences with you in a meaningful way?